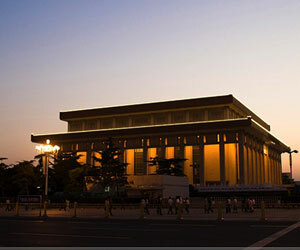 The chairman Mao Zedong Memorial Hall stands on the former sits of Zhonghuamen Gate at the southern end of Tian'anmen Square between the Monument to the People's Heroes and Zhengyangmen Gate. Red Sichuan granite is placed at its base and trees surrounded the hall. This was designed on principles of symmetry and "centrality". The first floor is open to the public. In the Hall of Mourning, the heart of the mausoleum lies Mao (1893-1976) in his usual gray suit, draped with the red flag of the Communist Party, in a crystal casket. The rare Phoebe nanmu wood of the doors and walls was carted north from a peak on Hainan Island under the supervision of Zhou Enlai.